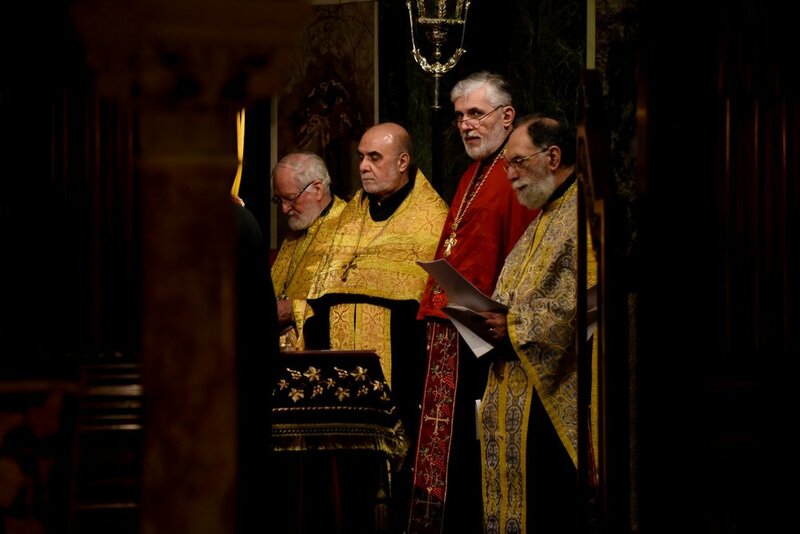 The traditional Pan-Orthodox Vespers was celebrated on the first Sunday in Lent at the Greek Orthodox Cathedral of the Holy Wisdom in Bayswater, London. His Grace, Bishop Athanasios of Tropaeou, presided in place of His Eminence, Archbishop Gregorios of Thyateira and Great Britain. Archimandrite Theonas (Balkalis), the senior priest of the Cathedral, was principal celebrant, and clergy from all ten dioceses of the Local Orthodox Churches represented in London concelebrated. Despite the unseasonably cold weather, a large crowd of worshippers comfortably filled the Cathedral. The chanters of the host Cathedral together with the choirs of the Antiochian, Russian, Serbian, Romanian and Georgian cathedrals sang the service in their respective languages. The address was delivered by Archimadrite Chrysostomos (Michaelides). At the end of the service, there was a procession with the holy icons, commemorating the dogmatic definition of the Seventh Ecumenical Council in 787 AD concerning the veneration of icons and the restoration of the icons to the churches by the Empress Theodora in 843 AD. After the service, everyone present was invited to a splendid Lenten meal in the Cathedral crypt. 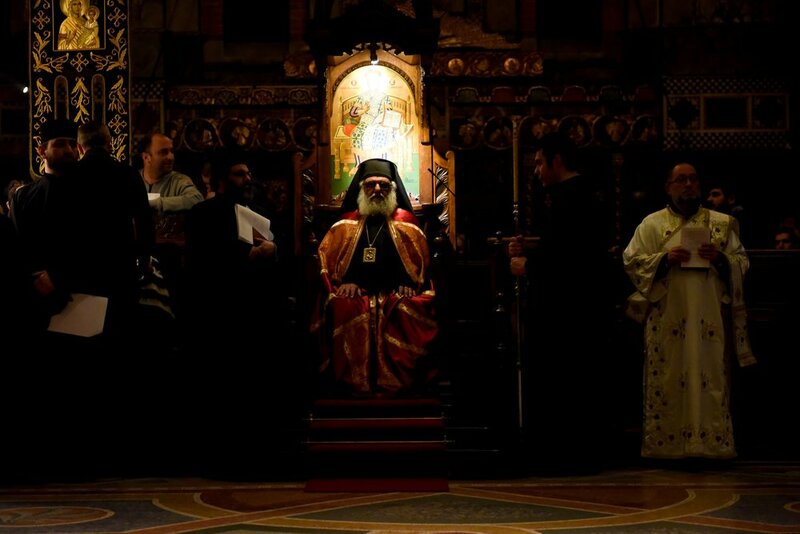 by the kind invitation of His Eminence, Archbishop Gregorios of Thyateira and Great Britain and in in the presence of other hierarchs, clergy and faithful of the Orthodox churches in London. The sermon will be given by Archimandrite Chrysostomos Michaelides. Members of the Episcopal Assembly for Britain and Ireland who will be attending a regular meeting of the Assembly will concelebrate the Divine Liturgy at 8.30 am on Saturday, June 4th, at the Romanian Orthodox Church in Holborn, by the invitation of His Grace, Bishop Ignatie of Mures. The Chairman of the Assembly, His Eminence Archbishop Gregorios of Thyateira and Great Britain, will preside. The bishops last celebrated the Liturgy together at the 10th meeting of the Assembly in April 2015. All are welcome to come and pray at the Liturgy. 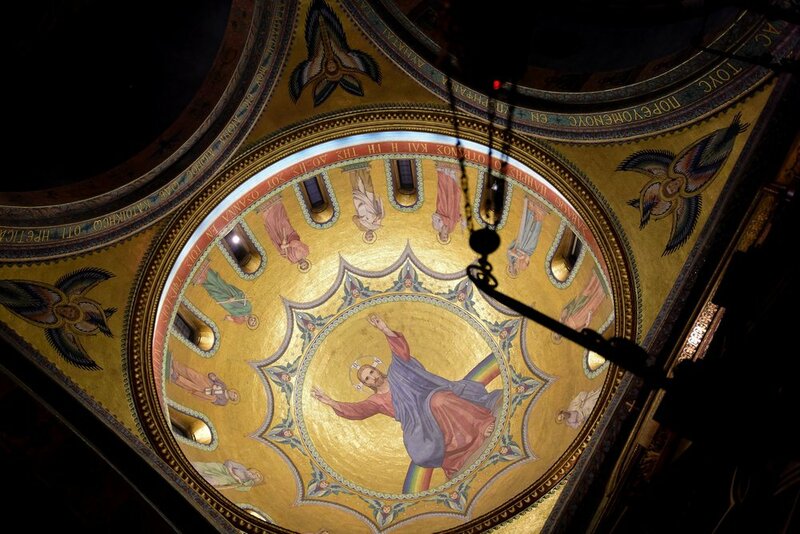 The address is Romanian Orthodox Church, St Dunstan in the West, 186a Fleet Street, London EC4A 2HR. The 11th Meeting of the Pan-Orthodox Episcopal Assembly of Britain and Ireland took place on 23rdOctober, 2015 at the Russian Orthodox Cathedral of the Dormition and the Holy Royal Martyrs, Chiswick, London. Welcoming the members of the Assembly, the Chairman, His Eminence Archbishop Gregorios, urged them to work together in harmony for the good of the Orthodox Church in these Islands. He also informed the Assembly about the forthcoming visit to Britain of His All-Holiness Patriarch Bartholomew of Constantinople and drew attention to the needs of the the refugees from the Middle East who were now coming to this hospitable country. The bishops reviewed the design and content of the Assembly website (www.episcopalassembly.info) and agreed that it was a useful means of publicising their work. They also approved the final draft of their pastoral recommendations regarding mixed marriages and agreed to bring it to the attention of their clergy. The Assembly heard a report from His Eminence Archbishop Mark about the 5th Pan-Orthodox Preconciliar Committee Meeting that he had recently attended. His Eminence Archbishop Elisey gave a report from the special committee for local saints that had been established at the previous Assembly meeting. It was clear that much work in this area had been done by various individuals over several decades and that the veneration of the ancient saints of these islands was developing organically, as witnessed by the increasing number of Orthodox communities dedicated to one or more of these saints and the pilgrimages to the sites associated with them. The task of the committee was to assist the bishops in drawing together the work done already into a common synaxarion of recognised saints that could be presented to the Mother Churches. It was recognised that this would be an ongoing process. The date and location for the Pan-Orthodox Vespers (Sun Mar 20th, 6pm, at the Russian Orthodox Cathedral, Ennismore Gardens) was noted. It was agreed that the next meeting should take place on Saturday June 4th at the Romanian Orthodox Church in Holborn. There would be a concelebrated Divine Liturgy in the morning, followed by the meeting in the afternoon. The meeting concluded with a lunch offered by the host, Archbishop Mark. On 25th April, at the invitation of His Eminence Archbishop Elisey of Sourozh, members of the Pan-Orthodox Episcopal Assembly of Britain and Ireland concelebrated the Divine Liturgy at the Dormition Cathedral of the Diocese of Sourozh in London’s Knightsbridge. We, bishops of the Orthodox Churches who exercise our ministry in Britain and Ireland, wish to express our prayerful solidarity with the Christians of the Middle East and Africa, who today are experiencing a degree of suffering and overt persecution unprecedented in modern times. The almost daily reports of atrocities, tragic loss of life and displacement of whole populations fill our hearts with sorrow as we witness the systematic destruction of the Christian presence in lands sanctified by centuries of prayer and marked by the peaceful life of these ancient Christian communities. At the same time we are heartened by the courageous witness of those who lay down their lives rather than deny their faith, as well as by the general refusal of the Christian communities to resort to violence. The 10th Meeting of the Pan-Orthodox Episcopal Assembly of Britain and Ireland took place on 24th April, 2015 at the Russian Orthodox Cathedral of the Dormition, Ennismore Gardens, London. Members of the Pan-Orthodox Episcopal Assembly for Great Britain and Ireland, who will be attending a regular meeting of the Assembly, will concelebrate the Divine Liturgy at the London Cathedral of the Dormition, Ennismore Gardens, on Saturday, April 25th at 9.30am by invitation of His Eminence Archbishop Elisey of Sourozh. The Chairman of the Assembly, His Eminence Archbishop Gregorios of Thyateira and Great Britain, will preside. This will be the second time the assembled hierarchs have celebrated the Liturgy together. The first celebration took place at the 3rd meeting of the Assembly in June, 2011 (photogallery). All are welcome to pray at the Divine Liturgy for the 'peace of the whole world, for the steadfastness of the holy Churches of God and for the union of all'.